It's 2013. Of course Santa Claus has traded in his sleigh and reindeers for a fighter jet. That way he can zip around the world in the coolest rig possible. 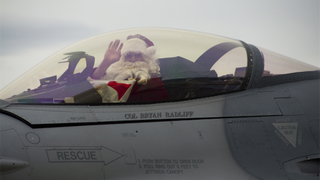 The US Air Force posted this picture of a pilot in a Santa costume for a bit of holiday cheer. Happy Holidays everybody!